Registry is a database used by an operating system to store configuration settings of windows components like installed hardware, software and much more. Demo project can be downloaded from here. 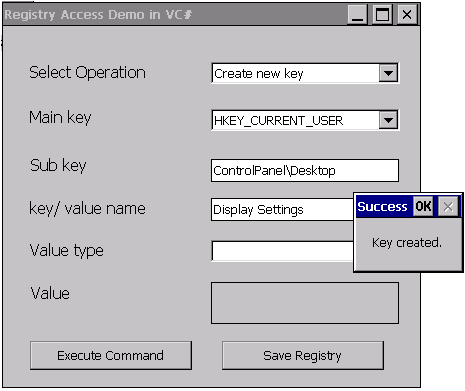 Goto My Device > Program Files > vcpp_registry_access_demo and run the application vcpp_registry_access_demo.exe. Application will create a key, a value in that key and read that value back. Then after deleting the value and the key it will save the registry. 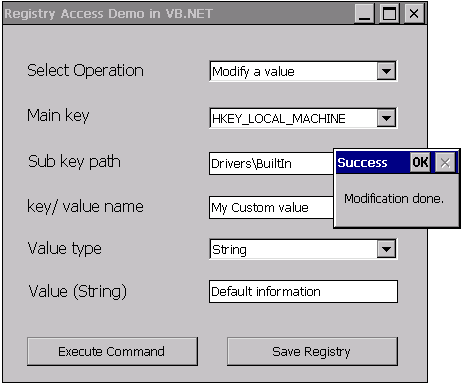 Go to My Device > Program Files > vbnet_registry_access_demo and run the application vbnet_registry_access_demo.exe. Following GUI will open where you can create, modify, read and delete the keys and values in the registry. Go to My Device > Program Files > vcsharp_registry_access_demo and run the application vcsharp_registry_access_demo.exe.